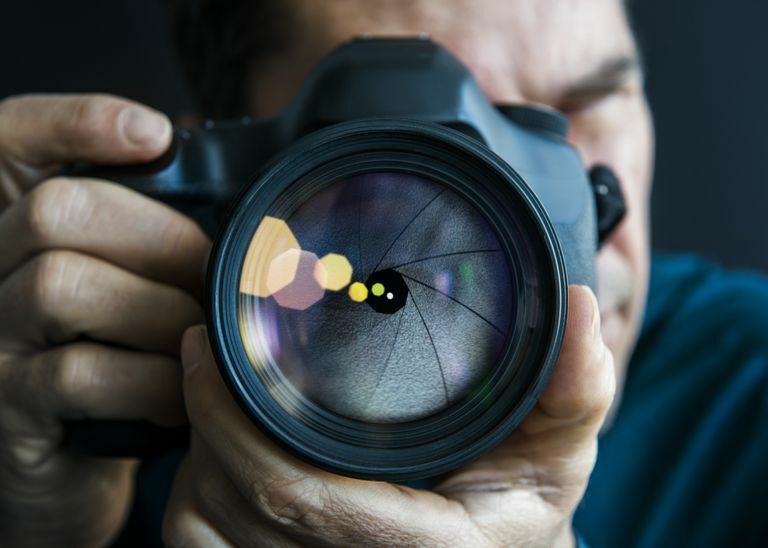 Professional photographers rely on aperture to control the amount of light passing through to the camera's image sensor. The term refers to the iris in the camera lens opening or closing to allow varying levels of light. The camera's aperture is measured in f-stops. Aperture control performs two essential functions on a digital single-lens reflex (DSLR) camera. In addition to managing the amount of light passing through the lens — leading to brighter or darker images — it also controls depth of field, which is a technical term for how sharp or blurry objects appear beyond the object at the center of the camera's focus. F-stops pass through a huge range, particularly on DSLR lenses. Your minimum and maximum f-stop numbers will depend, however, on the quality of your lens. Image quality can drop when you dial in a small aperture, so manufacturers limit the minimum aperture of some lenses. Most lenses will at least range from f3.5 to f22, but the f-stop range seen across different lenses can span from f1.2 to f45. Let's start with aperture's simplest function first: control of your camera's depth of field. Depth of field simply means how much of your image is in focus around your subject. A small depth of field will make your main subject sharp, while everything else in the foreground and background will be blurry. A large depth of field will keep all of your image sharp throughout its depth. Depth of field, compared. Licensed to DotDash. Use a small depth of field for photographing things like jewelry and a large depth of field for landscapes. There isn't a hard-and-fast rule, though, and much about choosing the right depth of field comes from your own personal instinct as to what will best suit your subject matter. A small depth of field is represented by a small f-stop number. For example, f1.4 is a small number and will give you a small depth of field. A large depth of field is represented by a large number, like f22. When we refer to a "small" aperture, the relevant f-stop will be a bigger number. Therefore, f22 is a small aperture, whereas f1.4 is a large aperture. At f1.4, the iris is wide open and lets a lot of light through. It's, therefore, a large aperture. Another way to help remember this is to recognize that aperture actually relates to an equation where the focal length is divided by aperture diameter. For example, if you have a 50mm lens and the iris is wide open, you might have a hole that measures 25mm in diameter. Therefore, 50mm divided by 25mm equals 2. This translates to an f-stop of f2. If the aperture is smaller (for example, 3mm), then dividing 50 by 3 gives us an f-stop of f16. Changing apertures is referred to as "stopping down" (if you make the aperture smaller) or "opening up." Since aperture controls the amount of light coming through the lens onto the camera's sensor, it has an effect on the exposure of an image. Shutter speed, in turn, also has an effect on exposure since it's a measurement of the amount of time that the camera's shutter is open. This balancing act between aperture, shutter speed, and ISO is called the "iron triangle" of photography. If you want a small depth of field and have chosen an aperture of f2.8, for example, then your shutter speed will need to be relatively fast so that the shutter is not open for long, which could cause the image to overexpose. A fast shutter speed (such as 1/1000) lets you freeze action, while a long shutter speed (e.g., 30 seconds) allows for nighttime photography without artificial light. All exposure settings are determined by the amount of light available. If the depth of field is your primary concern, then you can adjust the shutter speed accordingly. In conjunction with this relationship, you can also change the ISO of your camera to help with lighting conditions. A higher ISO (represented by a higher number) supports shooting in lower-lighting conditions without having to alter shutter speed and aperture settings. However, a higher ISO setting increases grain (known as "noise" in digital photography), and image deterioration can become obvious.